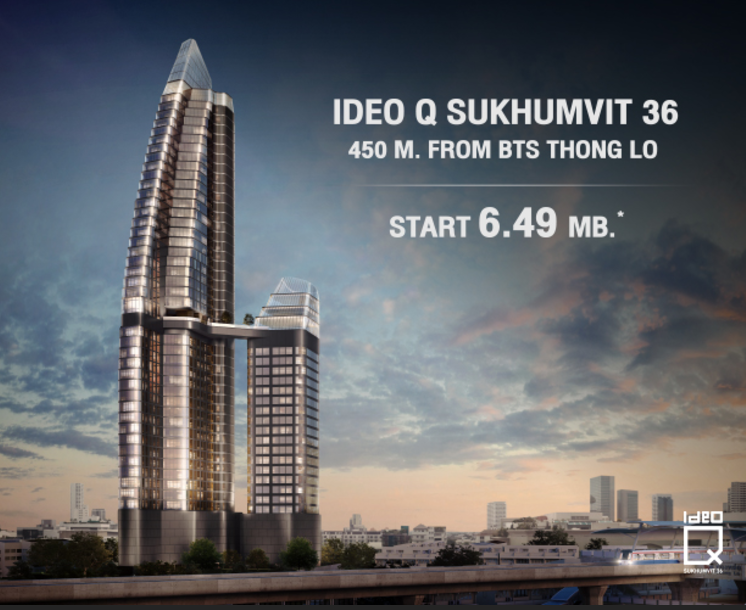 Ideo Q Sukhumvit 36 is a new launch condominium in Bangkok by Ananda MF Asia Thonglor Company Limited. Located 450 meters from BTS Thong Lo, the luxury freehold condominium will start construction in November 2017 and expected to complete in April 2020. Sukhumvit 36 is a dream location in the heart of Bangkok, surrounded by convenient amenities for a modern urban lifestyle. The 449 unit project will consist of 2 residential block, building A and building B, 47-storey and 24-storey respectively. Be greeted in awe by the lobby lounge which is inspired by the spectrum of lights, our lobby lounge is uniquely designed to reflect the property’s identity. Sky Onsen, an onsen pool decked out in black tiles serves as a new dimension of repose, complemented by a spectacular bird’s-eye-view of pulsating Sukhumvit road down below. Experience a workout like never before thanks to our customizable space that tailors to your demand, whether it be a group cardio class or a personal training session. Our golf simulator allows you to tee off without having to step your foot outside. For more information on Ideo Q Sukhumvit 36, simply fill up your details below and our salesperson will get in touch with you shortly!